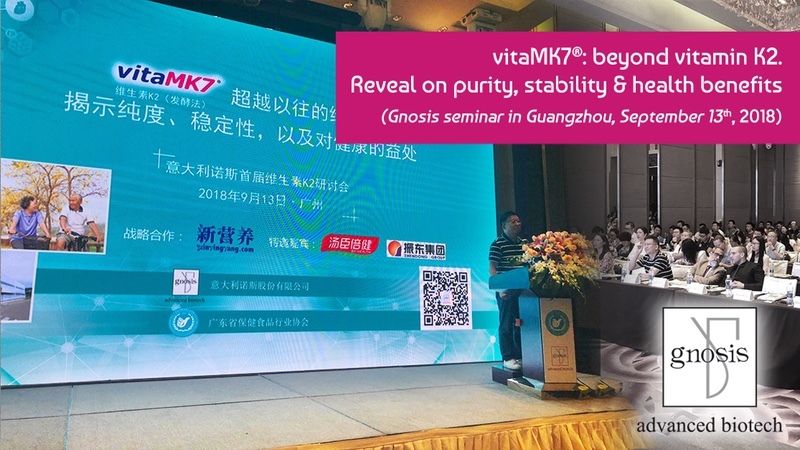 With great interest and attention from the audience, the first workshop of Gnosis in China on Vitamin K2 – “vitaMK7: beyond vitamin K2. 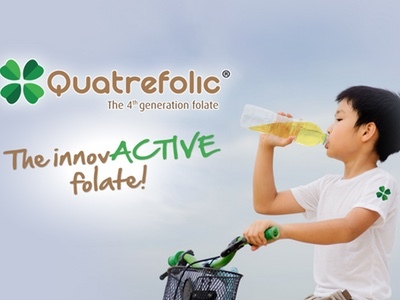 Reveal on purity, stability & health benefits” – held in Guangzhou 13 September, gained a lot of success and acclaims, exceeding also the expectations of the attendees. In collaboration with the HealthCare Food Profession Association of Guangdong Province, the event saw more than 150 auditors and most of the important Chinese companies that have been operating for many years in the pharmaceutical/nutraceutical markets, leaders in offering innovative finished products with reliability and quality. Among these companies, it is worth to mention Zhendong and By Health, two big local enterprises, leaders in the nutrition and health food industry. The vitamin K2 workshop was a remarkable occasion to disclose the latest research results of this ingredient, to discover what is happening in other markets showing data and perspectives of growth for the next years and, finally, to be lighted up about the most important aspects of quality that this ingredient should have to make the most of it. 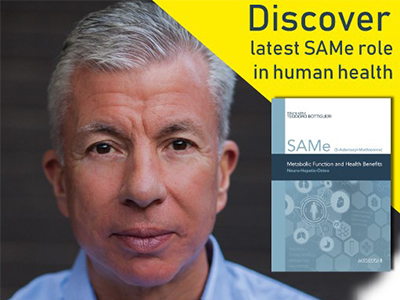 Auditors included key opinion leaders, research and development directors, scientists and medical doctors, all interested in learning about the emerging role of vitamin K2 as MK7 as a key factor in bone and cardiovascular health. The speakers, in particular Professor Chen Yuming - Professor in Nutritional Epidemiology at the Department of Medical Statistics & Epidemiology, School of Public Health, Sun Yat-sen University (SYSU) - and Professor Luca Tiano - Associate Professor of Biochemistry at the Department of Life and Environmental Sciences University of Marche (Italy) - contributed significantly to the success of the workshop, demonstrating the importance of research in this field. The final session – a Roundtable Forum organised by Gnosis with the special participation of Zhendong and By Health - was a great opportunity for Gnosis to deepen a few aspects emerged during the speeches, to exchange information and give ideas for new researches, thus consolidating the business relationships with the Chinese companies. 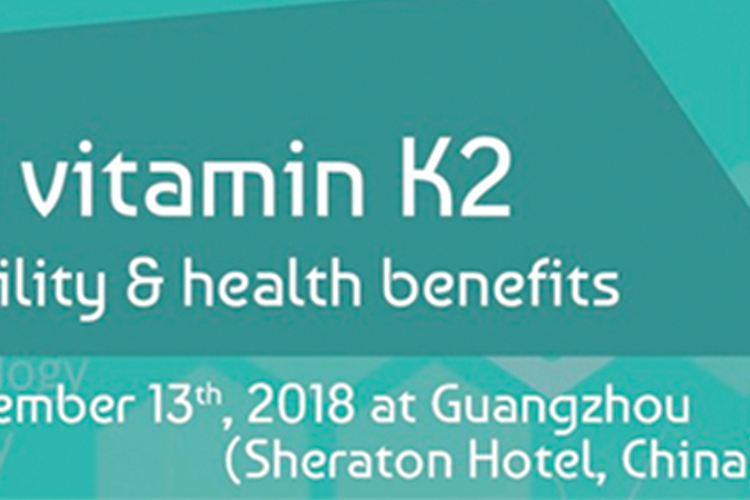 Silvia Pisoni, Marketing Manager of Gnosis, commented: “Close to the important scientific findings about vitamin k2 role in health, it is important to keep high attention on the quality profile that an excellent vitamin k2 must have, that impacts on its efficacy and safety. 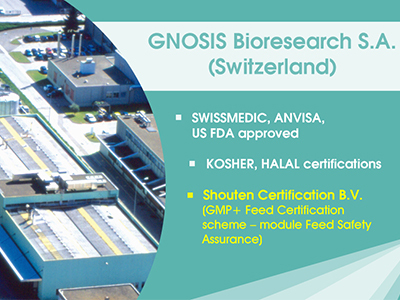 Gnosis VitaMK7 is the natural, pure and stable form of vitamin K2 as MK7, produced in one of our GMP European manufacturing sites, with a warrant of origin, quality and safety of the ingredient."